Codementor Support - How does the referral program work? All Categories ​>​ I&apos;m a Mentor ​>​ Payouts ​>​ How does the referral program work? Here at Codementor, we're building a vibrant community where developers help and learn from each other. We think you should be rewarded doing just that! In addition to Codementor, we've added CodementorX to the program and streamlined it. This allows you to invite not only just fellow developers to the platform but also users/clients who are looking to hire freelance developers. 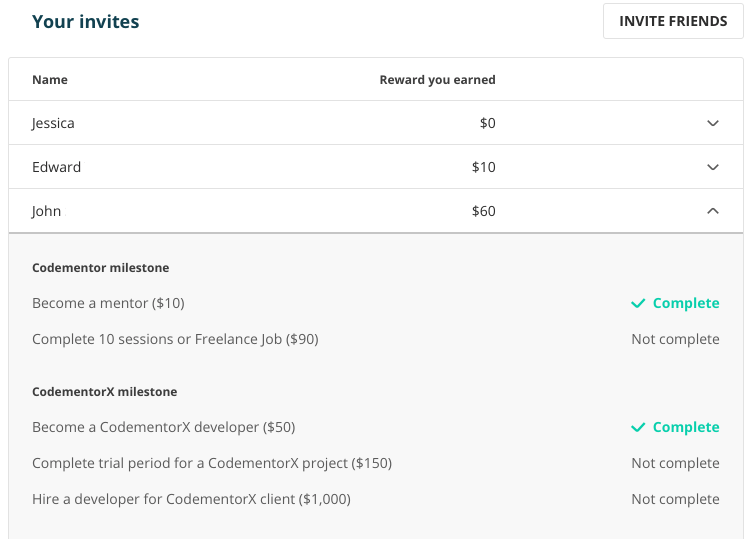 We've designed the new referral program in such a way that you can earn the maximum rewards possible across both Codementor and CodementorX. 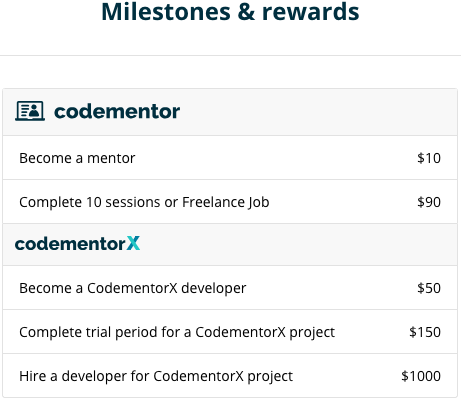 You have the chance to earn up to $1300 USD as rewards for inviting friends to join Codementor and CodementorX. You can find your referral code following the Referral Program tab on your Codementor dashboard (see below) or in your Settings page. There are several types of Rewards. At each stage, you will earn rewards - up to $1300 per person you refer to Codementor and CodementorX. Once the friend that you refer is approved to be a mentor, the remaining rewards are only available if they occur within the first 6 months of being approved. Keep up with all your invites and rewards! You can track all your invites and their progress in the Your Invites and Rewards tab. Encourage your invitees to complete the milestones, so you can both enjoy the sweet rewards! Once you have at least $100 of Unredeemed Rewards, the "Redeem" button will be enabled. In order to redeem your rewards, please click "Redeem" and you will receive the amount in your next payout. Once you have at least $100 of Unredeemed Rewards, the "Redeem" button will be enabled. Once you click "Redeem," you will receive further instructions on how to receive your payout. Please note that your friend must apply via your referral link in order for you to redeem the following rewards.